We may modify and add features to the Remediation Checklist in the coming days. This page is only visible to customers with OneLogin accounts on the US database shard as of May 31, 2017. As a Super user or Account Owner, go to Settings > Remediation. The Remediation Checklist page displays a row for each task category you must complete. If you don't see a category, you don't have to perform any remediation for that category. There are 3 types of rows: Information, Reviewed, and Completed. Information: This row will not change after you perform the action. The purpose of this row is to indicate that your account needs to perform this action. Reviewed: This row will be marked as Reviewed when all of the objects that you need to modify have been modified in some way. You must ensure that you follow the instructions for each of the objects mentioned. These objects may have been modified for other reasons and still need the task performed. Complete: We have data in the system to verify that this action has been completed. On the Remediation Checklist page, click the Action summary (for example "7 remaining") on any category row to view all of the tasks within the category. Reviewed tasks will be marked as - updated. When all tasks in a category are completed, the category row shows a status of Complete or Reviewed, depending on whether the task can be tracked to completion by the checklist logic (in the case of Secure Notes, the row disappears). A status of Information indicates that the checklist cannot track task completion. This status will not change. Some tasks include links to instructions, which you can also find below. Click any subtask to go to the primary administrator portal page where you can perform the subtask. Note that some of these tasks require multiple steps, both in OneLogin and in other apps. For a complete description of these tasks, see below. Click Download CSV in the Form-Based Apps, OneLogin OTP, or Google Authenticator rows to get a list of users/applications that require updates. 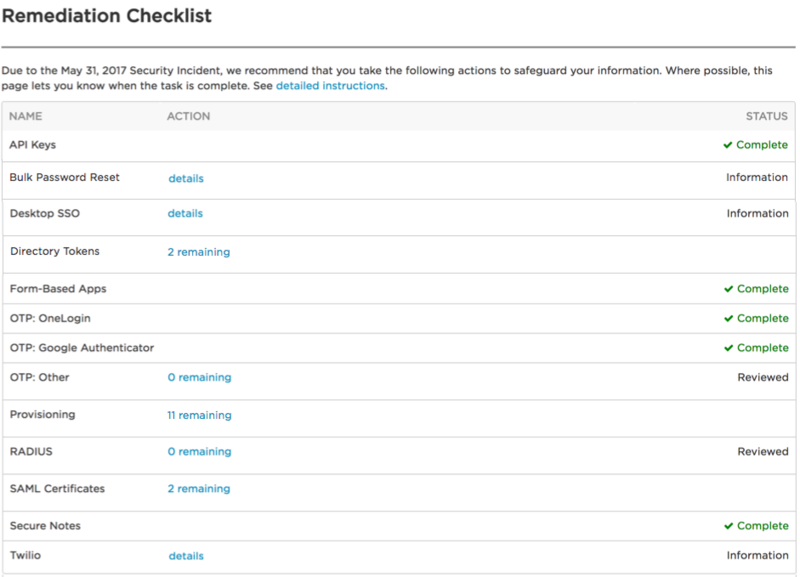 This section provides instructions for each category that you might see on the checklist page. You will be prompted here to force directory password reset for your users if and only if Enable Password Mapping is enabled in your Account Settings. We recommend that you use Bulk Operations to force password reset. See also Password Management and Password and Security FAQ. If you use Active Directory Connectors for Desktop SSO, you should generate and apply new directory tokens, as described here. Note. The directories listed here will not display as "-updated" until all directory connectors associated with a directory are interpreted by OneLogin as new. In other words, you cannot simply update tokens; you must use the OneLogin directory edit interface to delete the connector instances that used the old tokens. See the instructions below for details. Generate and apply new directory tokens for Active Directory Connectors. Generate and apply new directory tokens for LDAP Directory Connectors. Have your end users update their passwords for the form-based authentication Company apps that they can edit. Click Download CSV to get a list of all users and the apps whose password they must change. See also "Tasks Not Included on the Checklist Page that You Should Perform." Click Download CSV to get a list of all users who must update their Google Authenticator device registration. You can revoke access to Google Authenticator in bulk, and then have your users re-register their devices from their Profile pages. Or you can have your users de-register and re-register their devices themselves. See Bulk Revocation of Authentication Factors and Re-registering Google Authenticator with OneLogin. Click Download CSV to get a list of all users who must update their OneLogin OTP device registration. You can revoke access to OneLogin OTP in bulk, and then have your users re-register their devices from their Profile pages. Or you can have your users de-register and re-register their devices themselves. This is in addition to the re-registration required for OneLogin OTP and Google Authenticator. No other MFA devices or vendors need to be updated. Update the OAuth or API tokens you use to authenticate to app APIs for Provisioning. This applies only if you use OneLogin to provision users to apps -- except for Google Apps (G Suite) SAML, which also requires an OAuth token for SAML SSO. API authentication for provisioning can use OAuth tokens, SCIM bearer tokens, or API keys. For information about the apps you use, view the Provisioning doc for those apps in the App Integration section. In all cases, you will go to the Configuration tab for the app and disable the API or OAuth connection (for OAuth tokens, this means clicking the Clear Token button), and go to the administrator interface for the target app to revoke the token, update the keys, or change passwords. Note. The checklist lists all provisionable apps, whether or not you currently use them for provisioning. If you want the "updated" marker to appear on the checklist for the app, you must make a change on the Configuration tab for the app. If you do not use an app for provisioning, just add a couple of characters to the Self Service description field and click Save. Obviously, this is a bug and we'll fix it. Important! You cannot simply clear a token on the OneLogin side and reauthenticate with a new token or key, but you must also go to the client app admin interface to revoke the old token after reauthenticating. You must update the shared secret in both OneLogin and your RADIUS NAS. Click a certificate link to open the certificate page, where you can view the apps that use the certificate. Instruct your users to delete or update any secrets stored in Secure Notes. This category lists all users who have Secure Notes created before May 31, 2017, along with the total number of such notes. This section lists apps that were set up to use the credential option Configured by admin and shared by users. You, as an admin, must update the password for these apps. See also Adding a Form-Based Application and "Tasks Not Included on the Checklist Page that you Should Perform." If you use Twilio to provide OneLogin OTP via SMS, request a new AuthToken from Twilio and add it to your OneLogin account at Settings > Account Settings. You must be an Account Owner to perform this task. If you need a list of your users with personal apps, contact OneLogin support. If an app was set up to use the credential option Configured by admin, you, as an admin, must update user passwords. We recommend that you use CSV Batch Login Update. Note that the Shared Credentials row only shows apps that use the credential option Configured by admin and shared by users but does not show apps that use the credential option Configured by admin. See also Adding a Form-Based Application.